Our Products >> Bellana Visits Rome! Bellana Visits Rome! is the first in a series of children’s books that takes the reader on a fun-filled and memorable journey to some of our world’s most famous cities. Adventurous Bellana and her adorable animal friends—Molly the cat, Porkchop the bulldog, and Hopper the bunny—travel to Rome, Italy, in this fast-paced, colorful book and learn about some of Rome’s greatest historical sites, such as the Colosseum, Trevi Fountain, St. Peter’s Basilica, and the Sistine Chapel. Written specifically for the young reader, your child will enjoy learning about some of the most famous and historic sites and cities our world has to offer through the Tavel the World with Bellana series. 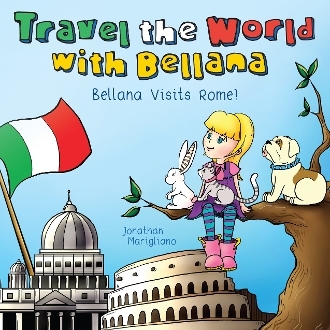 Join Bellana and her friends to learn more about the cities and countries thatmake up our wonderful world. “Is that before they had dump trucks and cranes?” asks Porkchop. “That’s before they had electricity,” laughs Bellana.